Butterflies flutter around the flowers as trained guides explain about the life cycle and natural history of these fascinating creatures. The tour begins with a 25-minute film that gives an introduction as to what will be experienced and what to expect. One of the most popular destinations close to San Jose, this two-hour guided tour inside this enclosed tropical garden with hundreds of Costa Rican butterflies fluttering around a cascading waterfall is a spectacular treat. 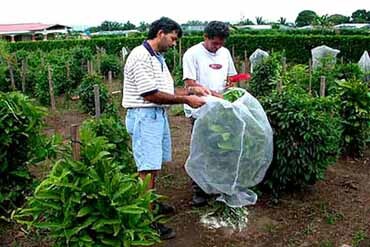 Costa Rica is one of the prime export dealers of the world in butterfly exporting. In the Butterfly Garden over a thousand butterflies that live their lives, feeding, mating and laying eggs. Visitors may touch the legs of butterflies and discover how they hold on to plants or try to find the lottery number on their wings. The tour proceeds to view the amazing metamorphosis of the caterpillar forming the pupae where their bodies change from a caterpillar into a beautiful butterfly. The entire cycle of the metamorphosis is shown and the early morning tours may even see the butterflies emerging from their chrysalides and taking off for their maiden flight. Typical of a fast-growing novel industry, the butterfly exhibits attract a broad range of entrants. There are hobbyists, particularly in Great Britain, who rear butterflies from the around the world in their backyards. The market is fed by clients who use butterflies to increase the allure of their tourist traffic to their resorts. A growing market for live butterflies is for butterfly releases at weddings and other special occasions. Butterflies are shipped much like ornamental plants, in a temperature controlled environment in the chrysalis or pupa stage, with an average 40 to 100 cocoons in each box. By the time they are delivered to their destinations, the chrysalis is ready to shed its cocoon and spread its new wings as a butterfly. 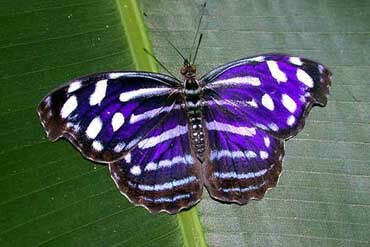 Depending upon their species, butterflies have a life span of only three weeks to a month, frequent shipments must be sent to replenish the exhibits. 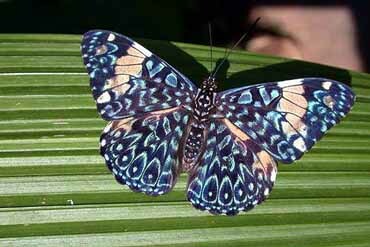 This butterfly farm is located on four acres in Alajuela Province. The main purpose of the farm is for the raising of butterflies to export to Europe. A 700 sq. meter visitors center and gift shop, an exotic netted garden which is home to over 500 butterflies, 50 different tropical plants and a picturesque waterfall make up the farm. The captive-bred butterflies dance around to the delight of spectators while they are also reproducing for export. The farm is open every day from 8:30 a.m. to 5:00 p.m. Guided tours commence at: 8:30 a.m., 11:00 a.m., 1:00 p.m. and 3:00 p.m. Guests are urged to arrive before 3:00 p.m. in order to benefit from the full tour. The tour ends in the gift shop, where guests are afforded more opportunity for questions and answers. Those people that wish to indulge in souvenirs from Costa Rica may do so. To contact the Butterfly Farm for more information call: (011) 506-438-0400 or logon at: www.butterflyfarm.co.cr.